Bank Of America: "If It Doesn't Bounce Now..."
On Thursday evening, we explained why to many traders the violent selloff observed on over the past two days had peaked: at exactly 2:43PM on Thursday, the NYSE was hit with a monster selling order perhaps the result of a last hour margin call. 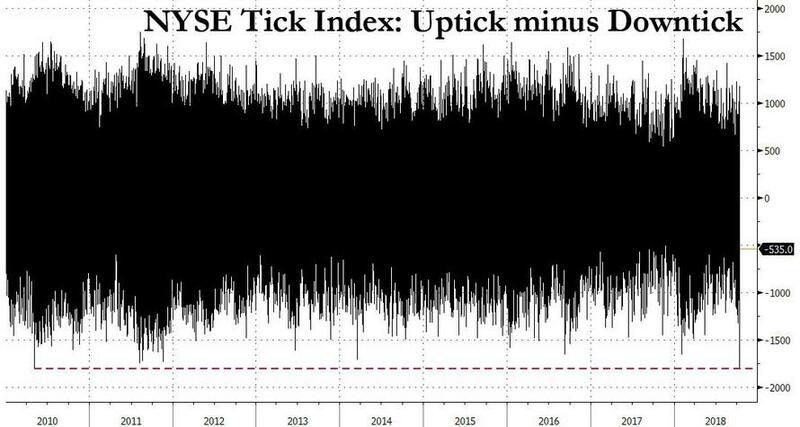 As measured by the NYSE TICK, or uptick minus downtick, index, the selling flood was so massive it not only surpassed the acute liquidation that was observed around 3PM on Wednesday, but the -1,793 print was one that had not been seen for 8 years: this was the lowest reading since the May 6, 2010 "flash crash" when liquidity dried up in markets, sending the market plummeting for a few minutes, as HFT briefly went haywire. More importantly, it also may have signified the peak of the current capitulation. 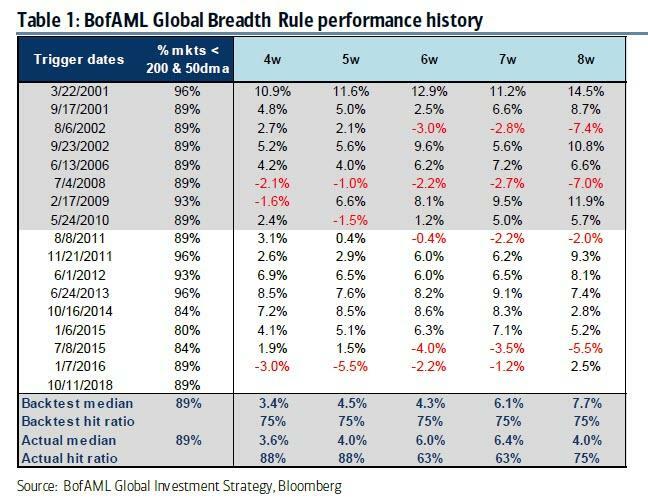 Interestingly, the question whether the liquidation is finally over is also the topic of Michael Hartnett's latest Flow Show, titled appropriately "If it doesn’t bounce now..."
According to Hartnett, after the recent selloff, the BofA Global Breadth Rule has been triggered as 89% of MSCI country equity indices <50 & 200-day averages. 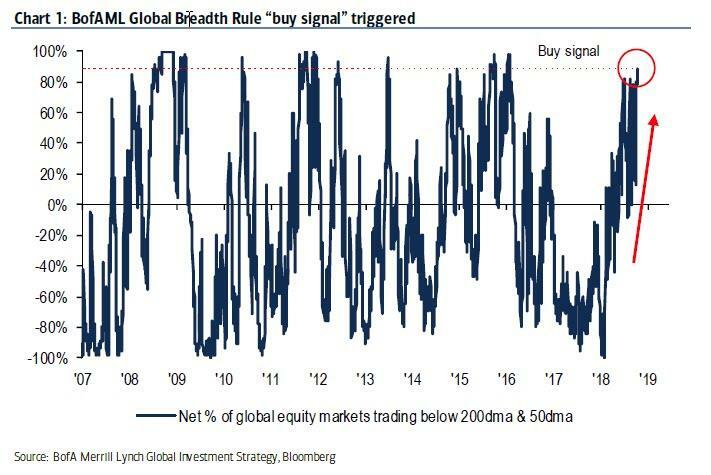 If indeed this is the upside tipping point, the BofA strategist notes that global stocks rallied 3.6% median in 4 weeks in past 7 out of 8 buy signals. 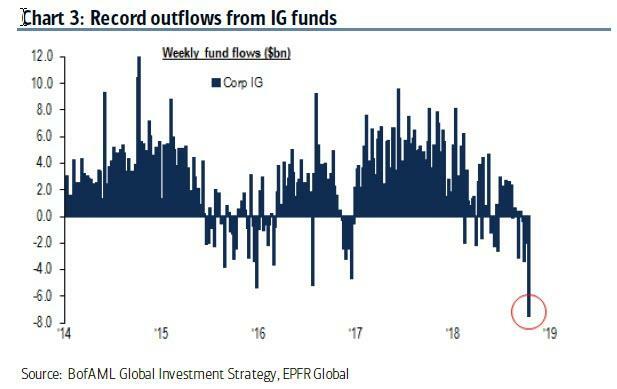 Yet even BofA is not absolutely certain that now is the exact time to jump in: according to the bank, this is not yet a Feb’16 entry point, as the BofAML Bull & Bear Indicator drops to 3.3 with Oct Fund Manager Survey cash at 5.5%, while a true hedge fund/CTA capitulation in risk assets is needed to stab Bull & Bear Indicator below 2.0, i.e. into buy risk assets for next 3 months zone. 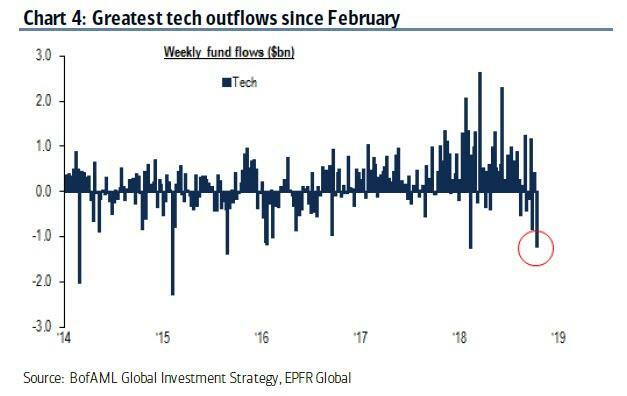 BofA, like Goldman earlier, also put the recent market action in context and makes the following stunning observation: almost two-thirds of global stocks are now in a bear market, while total-return portfolios are getting hammered as a result of the 3rd worst year for Treasuries in 40 years. Treasuries on course for 3rd largest annual loss in 40 years; 16 of 21 commodity markets in correction (>10% price decline); 1557 global stocks out of 2767 in MSCI ACWI in bear market (>20% decline); ACWI equal-weighted global equity index -17.9% since asset prices “big top” late Jan.
...massive HY outflows of $6.1bn, massive selling of Tech $1.2bn (in fact, the most since Feb sell-off). Populists vs. Bond Vigilantes: supply of Treasuries ($550bn to $1088bn this year) best explanation for Treasury sell-off; Powell controls short-end, Trump the long-end; note break of 3% on Treasuries has been Maginot Line for risk...see homebuilders, banks, US$. Financial speculation: one reason Fed determined to tighten...JUUL vaping startup took just 7 months to raise $10bn in VC funding, fastest startup in history to reach “decacorn” milestone (4x faster than FB, 5x faster than Snap, 11x faster than Dropbox).